Making Tax Digital is bringing a revolution to the business world and in particular how they are going to make their reports to the HMRC. The big changes are coming through the proposals being made under the title “Making Tax Digital”. Originally these proposals were going to start for some businesses as soon as April 2018, but the election last summer and pressure from various groups, including the Institute of Chartered Accountants in England and Wales, meant that the plans were delayed and will not start until 2019. The initial proposals were also wide ranging and would have meant that only a few of the smallest businesses would have been fully exempt from sending in their returns in a digital format on a quarterly basis. When the proposals re-emerged after the election, there had been a major revamp. The revisions meant that the only businesses to be immediately be affected are those that are registered for VAT, who will now longer have the option to make their submissions on a paper return. It should be mentioned that it is reported that around 98% of all VAT registered businesses are already filing online. HMRC are of course making all of the right noises about not expanding the requirements until everything in their online world is running smoothly and that this won’t happen until at least April 2020. But there are many that think this could easily mean that this when the full reporting for Income and Corporation Tax is planned to start. And if the problems that many of our client’s are still experiencing with HMRC’s Real Time Information (RTI), years after it was introduced, then it is unlikely that HMRC will bother to wait until all of the problems are really ironed out. 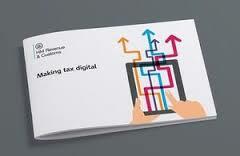 Why are HMRC taking these steps to introduce Making Tax Digital? Greater information and earlier notification of liabilities are all put forward as plus points from the governments point of view. And presumably, as you already meant to pay your VAT liability by direct debit, there will also be plans sooner or later to take any tax directly from your bank account on the day it is due. Plus of course after the initial bedding in period, there will be the inevitable penalties and fines! The cost of compliance with the MTD proposals were put by HMRC at a little at under £300 per annum per business. With the introduction of Making Tax Digital, it seems that HMRC are hoping that their “customers” will stop using Excel spreadsheets and move to more sophisticated and reliable accounting software. Of course, this will be overkill for many clients, but the cost of mistakes and converting spreadsheet data to the required format will outweigh these concerns. Of course, this will be overkill for many small businesses, but the cost of mistakes and converting spreadsheet data to the required format will outweigh these concerns. So, it would appear that software is the way forward for compliance with Making Tax Digital, even for a one man businesses. In you have concerns about Making Tax Digital call Brian Russell on 01661 872004.